A village in southwest Morocco has found a way to avoid long, arduous treks for water and is now harvesting fog for water on a large scale. 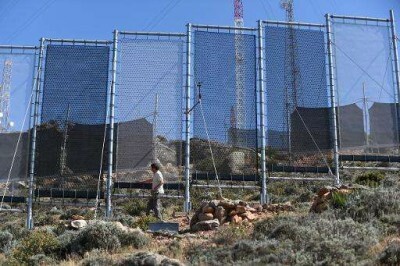 The Berber communities are using a fog harvesting technique developed in Chile about 20 years ago. This method of water harvesting is also being used in Peru , Namibia and other countries. A thick shroud of fog looms over a mountain named Boutmezguida at a height of 1,225 metres near the Moroccan villages. The fog is collected in finely meshed panels and drawn in to a network of water pipes that reach the villagers. “Our rain here is the fog. This is ecological and enables us to look after the regional water table, which we have been emptying away,” says Aissa Derhem, the chairman of a regional association called Dar Si Hmad for Development, Education and Culture (DSH). “During droughts, water was carried in by tanker trunk. That took a fortnight and cost 150 dirhams (13.7 euros, $15.6) for 5,000 litres on average,” recalls Houcine Soussane (as reported by phys.org). Now with the new fog harvesting technology, 7,000 litres of water collected from fog costs 3 times less than before. Villagers spend their time collecting the famous fruit of argan tress and extract its prized oil that fetches a great sum in the international market.